MR. COONEY: Mr. Chairman, before you take up the main business of today’s hearing, could I apply to you for very limited representation and I do so on behalf of Ms. Catherine O’Brien, the wife of Mr. Denis O’Brien. What I have to say will be very short and brief, it won’t take up much time. CHAIRMAN: Of course I’ll hear you Mr. Cooney. I don’t think it needs a representation. MR. COONEY: I respectfully agree, Mr. Chairman. May it please you. Certain, I suppose, complications have arisen in connection with the attendance of Mr. O’Brien since last Thursday. You’ll be aware, Sir, that these complications were connected with what has now turned out to be a very happy occasion for Mr. and Mrs. O’Brien, the birth of their second child. But they have also involved the non-attendance of Mr. O’Brien at the Tribunal’s public sittings on last Friday and the Tribunal has been informed that Mr. O’Brien will not now attend until next Monday. The Tribunal was initially informed that he would not be available for a further two weeks and this caused a considerable amount of difficulty from the point of the conduct of the Tribunal’s proceedings and, in particular, the fact that the Tribunal had configured its proceedings and the arrangements for the witnesses at these proceedings in such a way as to facilitate Mr. O’Brien, and in addition, in a way which entailed Mr. O’Brien giving the bulk of his evidence before any other relevant witness gave his or her evidence. This has now resulted in a situation where the Tribunal is effectively completely hampered in proceeding with this aspect of the Tribunal until such time as Mr. O’Brien makes himself available and this, it appears, will leave the Tribunal in a position where it has to abandon its work, at least so far as the actual evidence at its public sittings is concerned, until next Monday. Now, there has been a course of correspondence between Mr. O’Brien’s solicitors and the solicitors to the Tribunal concerning this matter and I think it might be of assistance if I were to open that correspondence so that the position in which the Tribunal now finds itself, will be clear to the members of the public and to other interested parties involved in this aspect of the Tribunal’s work. Now, you’ll recall, Sir, that last Friday morning Mr. McGonigal indicated to you in the course of a submission, that Mr. O’Brien would not be available to attend and indeed he had so indicated to Mr. Coughlan on the previous evening. And he outlined the personal family circumstances which prevent Mr. O’Brien from being in attendance. At that time you indicated that you hoped that Mr. O’Brien would be able to be in attendance on today and that if it became necessary to make any other interim application, time would be set aside to do so on Monday, that was yesterday afternoon, at 2.30. I refer to this morning’s proceedings at the Tribunal when counsel for your client outlined the circumstances in which Mr. O’Brien would be unable to attend to give evidence at the Tribunal today. I refer also to our recent telephone conversation when I indicated that the Chairman wished to have a letter from Mrs. O’Brien’s doctor giving a detailed account of the precise circumstances which arose yesterday which necessitated your client’s departure to the UK. You indicated in the course of our telephone conversation that I should write to you in relation to this matter and that my letter should not be confidential. The Tribunal is not agreeable to corresponding with you on that basis. The Tribunal’s procedure is that its correspondence with all persons with whom it is dealing is confidential which means that neither the correspondence nor its contents should be disclosed to any person save for the purposes of assistance being provided to the Tribunal, and any such person to whom disclosure is made for that purpose should be informed of the confidentiality attaching to the communications. In response to that letter Messrs. William Fry solicitors wrote to the Tribunal by letter which was faxed to the Tribunal at 28 minutes past 7 on Friday evening. A letter which was also, in fact, hand-delivered to the Tribunal at or around the same time. I refer to your telephone call to me of 2.15pm today and to your requirement for confirmation from Mrs. O’Brien’s gynaecologist as to her condition and prognosis and as to the time at which Mr. O’Brien learned of her present difficulties. It is the belief of Mr. and Mrs. O’Brien that this request represents an unwarranted intrusion into their family life and, in particular, in Mr. O’Brien’s privacy. They are extremely distressed that the Tribunal counsel require him to disclose in public matters of a profoundly private nature. Mr. and Mrs. O’Brien were not aware that the Tribunal had required this as they could not be contacted this morning at 9.30am. The Tribunal has been aware for some time that Mrs. O’Brien was pregnant and four or five days previously Tribunal counsel was made aware of the imminence of the birth. They were shocked and outraged to become aware through the media that this had happened and are deeply hurt by the publicity that is now surrounding this matter. Mrs. O’Brien has always been concerned to preserve her privacy and has never willingly allowed herself to be exposed to publicity. She is not before the Tribunal, but has suffered damage as a result of its actions, and reserves her position accordingly. 2. A bias against our client. I submit that in, view of the circumstances, the Chairman may wish to consider how best to convey to Mrs. and Mrs. O’Brien his regret at exposing their private affairs to public discussion, and to give assurances to Mr. O’Brien that there would be no pre-judgement of his evidence. Mr. O’Brien has asked me to point out that he has cooperated fully with the Tribunal. He has waived rights of all confidentiality and privilege and has furnished, either directly or through me, more information concerning the current line of inquiry than any other party. He has voluntarily been away from his wife throughout this week, despite the fact she is in London, staying alone in a hotel in the final days of her pregnancy. He remained constantly on call either at the Tribunal or in proximity to it, despite actually being called as a witness for only brief periods. Indeed, having been told that he would be required as a witness yesterday, he was left sitting for two hours while his wife tried to contact him, and was not then called. Mr. and Mrs. O’Brien have, notwithstanding all of the foregoing, instructed me that they have requested the issue by Mrs. O’Brien’s gynaecologist of confirmation as requested by you, subject to the condition that its contents be revealed only to the Sole Member and to the Tribunal’s counsel. Mrs. O’Brien waives her rights to privacy and medical confidentiality only to this extent. Finally, Mr. O’Brien has asked me to inform you that it is his intention, following the birth of his child, (which is anticipated to occur tomorrow, 16th of June) to spend a period of approximately two weeks with his wife and children outside the State. He regards this period as a minimum which should reasonably be taken by him to discharge his parental responsibilities. During that period Mr. O’Brien has instructed me to continue to cooperate with you to the best of my ability and I will do so. A medical report was, in fact, furnished, but obviously the contents of that report will not be disclosed in the course of the remarks I intend to make. I refer to your letter of the 15th June, 2001 received by the Tribunal late on Friday evening. The Tribunal did not disclose the details of Mrs. O’Brien’s medical condition in public. These details were disclosed by your client’s counsel. Indeed it was a matter of some surprise to the Tribunal that, in the course of explaining your client’s non-attendance, his counsel should have disclosed so much of the detail of Mrs. O’Brien’s medical condition. It would have been sufficient, (as would be the normal course) to have provided this detail by way of a medical report. In the afternoon of Friday, 15th of June 2001 I requested a medical report outlining the condition. I was informed that any such request for a medical report should not be sent under cover of confidential correspondence. This reflected your client’s continuing determination to ventilate the details of these matters in public. The provision of medical reports to excuse or explain non-attendance has arisen before now in the context of the Tribunal’s proceedings. I hasten to add that it has usually arisen in the context of an anticipated inability to attend on the part of a witness. In your client’s case, you cannot be surprised that the Tribunal sought a medical report where your client had already absented himself from the Tribunal in the course of his evidence. This was not an unreasonable request in those circumstances. To suggest that the Tribunal’s request for a medical report or, the Tribunal’s request for an explanation as to what prompted your client’s absence, constitutes either a demonstration of bias by the Tribunal, or prejudice against your client, is to fail to understand the work upon which the Tribunal is engaged. The Tribunal is accountable to Dail Eireann in carrying out an inquiry under its Terms of Reference. It is, therefore, engaged in public business. Had the Tribunal proceeded in the case of your client without seeking either an explanation or a medical report, it would have exposed itself to charges of bias or prejudice in favour of your client. The Tribunal was informed early on in the course of its recent dealings with your client that by reason of his wife’s pregnancy and the fact that she was close to term he would be seeking an accommodation from the Tribunal to enable him to attend the birth. This information was relayed to John Coughlan, senior counsel, by your client’s counsel, Eoin McGonigal, senior counsel, in the course of a telephone conversation. Mr. McGonigal was informed that the Tribunal would facilitate your client. At that point, there was no mention that your client would be absent from the jurisdiction for two weeks following the birth, to enable him to be with his wife and child. This is a facility which, as far as the Tribunal is aware, has never been sought by a witness in any proceedings, judicial or otherwise, in this country, and is one to which, without a more comprehensive medical report, the Sole Member could not agree. You will be aware that the Tribunal has already afforded your client an indulgence in connection with his wife’s pregnancy. As you will recall, shortly after the Tribunal’s first contact with your client, the Tribunal endeavoured to arrange a meeting with your client. It proved difficult to agree on a suitable date. Your client was involved in intensive activity in connection with his Eircom bid. According to your client, these activities had taken him away from his wife for some considerable time. He, therefore, wished to return to Portugal to be with his wife, and to this the Tribunal agreed. Eventually a meeting was arranged for Friday 4th May, 2001. In the afternoon of Thursday, the 3rd May, 2001 you were in contact with me concerning the meeting. A few hours later I was informed that the meeting was not going ahead. There appears to be no reason why the Tribunal could not have been informed of this at the time of our conversation. Your client must appreciate that the Tribunal cannot continue to facilitate his diary by arranging to dispose of its business to accommodate your client’s business and personal commitments. The Tribunal has now had an opportunity of reading a medical report, for which the Tribunal is much obliged. Noting the concerns expressed by Mrs. O’Brien’s gynaecologist, the Tribunal is also gratified to note that Mrs. O’Brien was delivered of a healthy baby girl and, notwithstanding the undoubtedly stressing concerns, both the mother and the child are healthy and well. The Tribunal is not disposed, as I have already indicated, in the absence of any compelling medical reason, to suspend its sittings for a further two weeks, or for that matter, a week, while your client is out of the jurisdiction. Your client’s evidence should be resumed at the earliest opportunity. Unless your client has some further information to provide the Tribunal the Sole Member is of the view that there is no reason why he should not attend to resume his evidence on Tuesday morning. By letter of the same day, the 18th of June, 2001, William Fry solicitors replied to Mr. Davis’s letter. That letter did not, in fact, arrive at the Tribunal until sometime late yesterday evening and although I notice that — in any case, it would appear that did not arrive at the Tribunal until in or about five minutes to seven o’clock. I refer to your letter of the 18 of June in response to my letter of the 15 of June. I have discussed this matter with Mr. McGonigal and position appears to be as follows – On Thursday evening, shortly after 7 p.m. in the offices of William Fry, Solicitors, Mr. O’Brien informed Mr. McGonigal that the situation regarding his wife’s pregnancy had changed in that: 1. the baby’s position had changed; and 2. the baby’s lack of movement was causing concern. Following discussion, Mr. McGonigal and I agreed that Mr. O’Brien should return to London and told Mr. O’Brien that Mr. McGonigal would call Mr. Coughlan. This Mr. McGonigal immediately did and he informed Mr. Coughlan that Mr. O’Brien was returning to London and that the reason was as had been explained to him by Mr. O’Brien and as referred to above. He also offered me as an alternative witness. Mr. Coughlan requested Mr. McGonigal to contact him at 9.30 that evening to enable him to communicate with the Chairman. Mr. McGonigal contacted Mr. Coughlan at 9.30 and was told that he had been unable to contact the Chairman and that Mr. McGonigal should ring him again on Friday at 9:00 a.m., when he hoped that he would have contacted the Chairman. Mr. McGonigal rang Mr. Coughlan at 9:00 a.m. on Friday and was told that he had not spoken to the Chairman but that he was on his way in to the Tribunal at that time and if Mr. McGonigal rang at 9.30-9.40, Mr. Coughlan would then have spoken to the Chairman. At 9.40 a.m. Mr. Coughlan informed Mr. McGonigal that the Chairman wanted an application made at 10.30 a.m.. Prior to the sitting of the Tribunal at 10.30. Nobody on behalf of the Tribunal sought or requested a medical report and, indeed, there was not at that time any available. 5. at no stage in the public session did the Chairman give any indication that he was in any way uneasy or concerned at the disclosures in the explanation given by Mr. McGonigal. As Mrs. O’Brien is not before the Tribunal, and was in a delicate state, the Chairman should have been more sensitive and, in particular, should have given a caution to the press in relation to these matters. The first attempt to obtain a medical report was made by the Chairman in the afternoon when I was phoned by you. Further correspondence then ensued, which again speaks for itself. I did not propose the omission of a confidentiality provision from your letter in order to “ventilate the details of these matters in public” but so that either I, or someone acting on behalf of Mr. O’Brien, could take such action as appeared to be necessary in regard to the matter, without being constrained by obligations as to confidentiality. I took a careful note of our conversation and there was no reference to public “ventilation” or disclosure in it. I do not accept that the Tribunal has any right to seek intimate details of the medical condition of a person who is neither before the Tribunal nor being inquired into by it; I expressed my outrage to you during our telephone conversation of the 15th June and I stand by my sentiments. The Tribunal was furnished directly with the medical report of Mrs. O’Brien’s gynaecologist on the evening of Friday, the 15th of June. I fully accept that to have proceeded without seeking an explanation might have created the impression (but not the fact) of prejudice in favour of Mr. O’Brien. This is not what occurred. The Tribunal sought and was given an explanation for Mr. O’Brien’s absence. As has been its practice in the past, it did so privately and it surely would have been quite sufficient to allay any public concern in the matter for the Sole Member to have announced on Friday morning that an explanation had been sought and obtained as to Mr. O’Brien’s absence. What occurred served merely to provide salacious details for the titillation of the public, and did not serve any bona fide public purpose. I would add that, given Mrs. O’Brien’s undeniable (and undenied) pregnancy and the birth on the 16th of June of her child, by cesarean section, no suggestion of bias or prejudice in favour of Mr. O’Brien could possibly have been made. Mr. O’Brien is in London with his wife. She is in hospital recovering from a difficult birth, combined with a surgical procedure. She has Mr. and Mrs. O’Brien’s infant daughter with her. Their infant son, who is 17 months old, is in the care of Mr. O’Brien. Mrs. O’Brien is shocked, upset and distressed by the events of last Friday and of the weekend, during which her fear and pain were compounded by the publicity surrounding this matter. She is away from the rest of her family, and wishes to have Mr. O’Brien nearby, both for his company and the comfort he can bring her and to assure her that their son is being properly looked after. The State recognises the importance and seeks to preserve the integrity, of the family. Among the ways it does so is by conferring parental leave on the parents of new-born children, in recognition of the importance of their presence in the period after birth. It seems to me to be entirely reasonable that, at least while Mrs. O’Brien is in hospital, Mr. O’Brien should remain with her. It is presently expected (although it is not certain)that Mrs. O’Brien will be discharged from hospital on Friday next, the 22nd of June. Assuming that occurs, Mr. O’Brien is willing to curtail the period originally proposed by him and to abandon the short holiday he had intended to take with his family, and to make himself available to the Tribunal from Monday 25th June to Tuesday, 3rd July. Thereafter he expects to be available for a period ending on or about the 16th of July. It is not the case that when I spoke to you on the 3rd of May, 2001, I could not have told you that the meeting arranged for the following day would not proceed. I have dealt with you at all times in the utmost good faith and I have not misled you. As soon as it became apparent that Mr. O’Brien would not be able to attending the meeting on the 4th of May, I told you so. In this regard I enclose a copy of the proposed offer formally submitted on 4 May to Eircom plc. This was worked on throughout the 3rd of May into the early hours of the 4th May. A short break (of about five hours) then occurred and we reconvened at 7 a.m. on the 4th of May. We continued to work on the document for the rest of the morning. There was very pressing business, tactical, regulatory and other reasons for the timing of this document which only emerged on the evening of the 3rd of May and I called you as soon as it was clear that we would not be able to make the meeting of the 4th of May. I would also remind you that you on the 16th of May at very short notice we met with you in private for over one half hours late in the evening. 1. He has cooperated fully with the Tribunal at all times and has instructed me to do likewise. Having said this, he can not be expected to devote his entire existence to the Tribunal and other affairs necessarily intrude from time to time. Where this has occurred, he has, nevertheless, tried to communicate with and to facilitate the Tribunal. 2. Mr. O’Brien was continuously available to the Tribunal for a period of 2 weeks up to Thursday last. This period ended with his being told that he would be called as a witness on the afternoon of Thursday last, the 14th of June. However, he was not called and, in hindsight, it is apparent that the Tribunal’s counsel must have known that Mr. Healy’s Opening Statement would consume the entire session. As a result, Mr. O’Brien was compelled to sit fruitlessly through the session. 3. Mr. O’Brien is both a family man and a businessman; he resides in Portugal and visits Ireland only as required. He cannot reasonably be expected to be permanently on call or to be on call at very short notice. It is important that a working arrangement be devised such that reasonable periods of notice would be given, and attempts made to facilitate Mr. O’Brien where it is possible to do so. In return, Mr. O’Brien will undertake to continue, to the greatest degree possible, his past cooperation with the Tribunal. 4. While the Tribunal’s desire to press on with its inquiries is accepted, the point must, in fairness, be made that its inquiries have so far lasted for almost 4 years and to say that they cannot be postponed for a few days while Mr. O’Brien spends a little time with his ill wife and young children, is extreme. As indicated above, this period is recognised by society and the State as one in which it is important for a family to be together. 5. While Mr. O’Brien appreciated the caution delivered by the Sole Member on the 14th of June concerning media reporting of the Opening Statement, he has nevertheless noted a great deal of hostile and inaccurate reporting and commentary thereon over the weekend. He wonders whether any action is intended to be taken by the Tribunal in this regard. I am advised by Mr. O’Brien’s counsel, Mr. Eoin McGonigal, SC, that last night at approximately 10.45 p.m. he received a telephone call from Mr. Coughlan, SC, counsel to the Tribunal. This morning Mr. Davis, solicitor to the Tribunal, responded to Mr. O’Connell’s letter and while he wasn’t able to respond to every part of it in the time available, this was his response. I refer to your letter of the 18th of June, 2001. Ms. Jacqueline O’Brien, BL, one of the members of the Tribunal legal team, spoke to you on the telephone at or around 4 p.m. yesterday afternoon and was informed that the Tribunal would be receiving a letter in response to the Tribunal’s letter of the 18th of June. The Sole Member, together with members of the Tribunal legal team, remained at Dublin Castle in order to be able to study this letter. The Sole Member, however, was obliged to leave Dublin Castle at 6.30 p.m., by which time the letter had not arrived. It was not until in or about 7.30 p.m. to 8:00 p.m. that contact could be made with the Sole Member to inform him that the letter had eventually arrived. It was not until much later last night that the Sole Member was able to study the letter and to assemble the members of the Tribunal legal team so that he could take their advice in connection with its contents. The Tribunal has not had any dealings with Mrs. Catherine O’Brien and does not envisage having any dealings with her. While the fact that she has been mentioned in the course of Mr. O’Brien’s dealings with the Tribunal is unfortunate, this is something which is entirely Mr. O’Brien’s doing. Turning firstly to last Friday morning when Mr. McGonigal indicated to the Tribunal the reasons for your client’s non-attendance; prior to the sittings, and just before making his submissions to the Sole Member, Mr. McGonigal pointed out to Mr. Coughlan that he would be obliged to make his submissions without the benefit of a medical report. This was not surprising in view of the time scale involved. As I have already indicated, this is the second occasion on which your client has referred to his wife’s pregnancy in connection with his dealings with the Tribunal. As you will recall, a meeting fixed for in or about the 4th of May, 2001 was put back to that date, a very late date as far as the Tribunal’s requirements were concerned, so as to enable your client to be with his wife at a time when, he had asserted, through you, that he had not seen his wife, who was then pregnant, for some weeks. On the third page of your letter, you state that Mr. O’Brien “has cooperated fully with the Tribunal at all times” and that he cannot “be expected to devote his entire existence to the Tribunal”. You go on to suggest that while the Tribunal’s desire to press on with its inquiries is accepted, “its inquiries have so far lasted for almost 4 years and to say that they cannot be postponed for a few days while Mr. O’Brien spends a little time with his ill wife and young children is extreme.” In this connection you draw attention to the fact that Mr. O’Brien resides in Portugal and that he visits Ireland only as required and that in the circumstances, “he cannot reasonably be expected to be permanently on call or to be on call at very short notice”. 1. That so far as possible, the Tribunal’s dealings with witnesses, both prior to and in the course of its public sittings, should be on a voluntary or non-coercive basis. 2. That witnesses attending at the Tribunal’s public proceedings should be in a position to give as good an account of themselves as possible and that this entails, at the very least, that a witness should be in a position to indicate demonstrably that he has appeared at the Tribunal’s public sittings without the need for the coercive process of a Witness Summons. 3. It also entails, as the Tribunal would be the first to accept, that a witness should be given reasonable notice to enable him to attend at the sittings and an opportunity of studying in advance any material on which he might be asked to comment. 4. Where the Tribunal eschews the service of a Witness Summons, this is on the basis of the witness’s undertaking to attend at the Tribunal sittings. This undertaking is not sought in writing but is usually obtained in the course of the Tribunal’s dealings with the witness’s solicitor. Where an express undertaking is not obtained, the Tribunal’s agreement to proceed without the issue of a Witness Summons implies, on the part of the witness, that he will attend without the need for any such coercive process. 5. In determining to what extent a witness should be obliged to attend, the dates on which a witness should be obliged to attend, and the extent of any witness’s attendance, the Tribunal will take account of all of the relevant surrounding circumstances, including the importance of the witness’s evidence; any views expressed by the witness himself as to his availability; a witness’s place of residence; and in particular his proximity to Dublin Castle; the feasibility in the context of a witness’s resources, in particular where a witness is not resident in Dublin or in the State, of attending the Tribunal; a witness’s health status, including, as the case of your client shows, any related health concerns such as the justifiable health concerns a witness might have for a member of his/her family. Mr. O’Brien is a successful international businessman who, has for some time, been resident in Portugal. While it seems that Mr. O’Brien has commercial interests in various jurisdictions, he nevertheless maintains a permanent staff on the sixth floor of 1 Grand Canal Street, Dublin 2, working from premises described on his notepaper as “Office of Denis O’Brien”. While Mr. O’Brien appears to have many international commercial interests, recent events concerning the Eircom bid attest to his willingness to devote a significant amount of attention to his commercial interests in Ireland. The importance of the work upon which the Tribunal is engaged cannot be over-estimated. Where Mr. O’Brien is concerned, his pivotal role as a witness in connection with the matters currently under inquiry, not to mention the Tribunal’s envisaged inquiry into the competition for the second GSM licence, can hardly be contested. Mr. O’Brien’s own stated desire to give evidence at an early date and his preference to give evidence in advance of other relevant witnesses, have already been mentioned. The Tribunal has configured its arrangements for witnesses to date on the basis of Mr. O’Brien’s importance as a witness, his stated preference to give evidence in advance of other relevant witnesses, and the fact that his evidence is likely to extend over a protracted period of time. One of the matters which has complicated the arrangements for Mr. O’Brien’s evidence is the volume of documentary material which has become available over the past two weeks. The extent of this material would have been well-known to Mr. O’Brien and his advisers. While the Tribunal could not have been expected to anticipate the extended duration of the Tribunal’s sittings to deal with this material, this is something of which Mr. O’Brien’s advisers must have been aware. A further complicating factor in Mr. O’Brien’s case was his wife’s pregnancy and the undoubtedly stressful circumstances surrounding what has now fortunately transpired to be a successful delivery. The Tribunal regards Mr. O’Brien’s legitimate family concerns as giving rise to additional commitments which have limited his availability to the Tribunal over the past few days. Taking all of the foregoing into account and having regard to the feasibility of Mr. O’Brien’s attendance (in the context of his personal resources) the Tribunal acknowledges that Mr. O’Brien may require some time to be with his family but cannot agree that this entails an absence until next Monday, a break of 10 days in the Tribunal’s sittings. 1. That information has been made available to the Tribunal that in 1997, at or around the time of the establishment of the Tribunal, the question of the relevance of remarks by Mr. O’Brien to Mr. Barry Moloney were canvassed in the context of both their relevance to the obligations of disclosure of the directors of ESAT Telecom in the context of an IPO, and any other obligations of disclosure of Mr. Moloney, Mr. O’Brien or the directors might have had in the context of the proceedings of this Tribunal. 2. That these matters were ventilated once again in 1998 in the context of inquiries being pursued by Telenor with the Fine Gael Party. 3. That notwithstanding the undoubted relevance of these matters, no attempt was made by your client, or any of the companies with which he was associated and which may have been involved, to bring them to the notice of the Tribunal. 4. Furthermore, from the commencement in March of this year of the Tribunal’s recent dealings with your client, and notwithstanding the numerous opportunities he had to disclose to the Tribunal the nature of the issues being canvassed in the course of the Initial Public Offer concerning two payments of £100,000.00 stated to have been made by him, one of which was stated to have been made to Mr. Michael Lowry, he chose not to do so. While the Tribunal has already noted your client’s assistance and the assistance of his Solicitors in providing the Tribunal with documentation and a response to queries, the other factors which I have mentioned above are matters which may ultimately have a bearing on the conclusions (if any) the Tribunal may reach as to whether your client has or has not cooperated. Now, as I said at the outset, that is the position which the Tribunal now finds itself, Sir, that — and I think the correspondence indicates the extent to which the question of Mr. O’Brien’s attendance or non-attendance and his continuing attendance have been canvassed, and I don’t think the position can be put any further in view of the fact that the Tribunal, as I said, has not served a summons on Mr. O’Brien and indeed, in only a very limited number of cases does it either threaten to or, in fact, issue a Witness Summons, only in the events I have mentioned. CHAIRMAN: In any event, if somebody is outside the jurisdiction it would be of little or no value. Before I hear from Mr. Cooney or from anyone else who wishes to be heard, Mr. Healy, I think I have already indicated that the actual order or sequence of witnesses should be as directed by the Tribunal and not by anyone else. 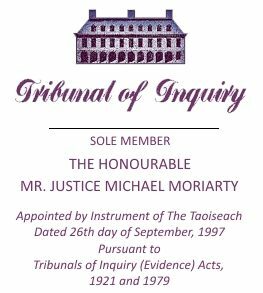 Subject to that, is there any feasibility, if it is indeed the case that the Tribunal is now, in effect, bound by a fait accompli as regards not being able to resume Mr. O’Brien’s testimony until Monday, is there any feasibility in any witnesses being dealt with in the latter part of the week? MR. HEALY: It’s not as if the matter hasn’t been canvassed. It is being looked into. I am aware that the Tribunal received a phone call in this matter which may enable the Tribunal to take up a matter with the witness. I haven’t been able to deal with that because there were other pressing matters. Certainly I don’t believe that Mr. Davis has any additional information which would make it possible for me to indicate at this point that the Tribunal could advance matters by having the evidence of another witness. There are very few witnesses which could be usefully interposed and you may recall that there was some discussion, I think in the course of last evening, that it might be possible to interpose a witness at this point whose evidence might not be, as it were, out of sync with the course of evidence to date, but I can’t say whether the Tribunal is going to be successful in arranging that before the end of the week. It might be possible to give an indication tomorrow on the Internet perhaps. MR. COONEY: Mr. Chairman, I should have told you that I am instructed on behalf of Mrs. O’Brien by Mr. Paul Mara for WG Bradley & Company and I have a very limited brief here, Mr. Chairman. And perhaps I could start what I want to say by referring to Mr. Healy’s opening comments that the birth of the baby daughter to Mr. and Mrs. O’Brien was a happy occasion, as indeed it was, Mr. Chairman, and it was an occasion which, from Mrs. O’Brien’s point in particular, was accompanied by a great sense of relief because, of course, the birth had become something of an emergency in the preceding days and, in fact, as you know, Mr. Chairman, the birth was eventually effected by means of a cesarean section which was quite a serious invasive surgical procedure. Her happiness, I have to tell you, Mr. Chairman, has also been marred by some of the remarks which have been made here at this Tribunal on Friday last and I must say, Mr. Chairman, by what Mrs. O’Brien regards as the sceptical tone of the remarks which were made by you in response to the explanation given to you by Mr. McGonigal for Mr. O’Brien’s absence. Her distress was further compounded, Mr. Chairman, when she learned that the Tribunal had made a peremptory demand that her treating gynaecologist should deflect from his professional duties for caring for her and his other patients, to write a report for the Tribunal. Mrs. O’Brien, as has been stated, is a very private lady and has taken pains always to prevent excessive publicity attending upon her and her family and she is, because of that persona, extremely distressed, Mr. Chairman by what has happened here in the Tribunal over the last few days and that has added considerably to the stress which this particular birth caused her. The fact that it has ended safely is a matter of great relief for her in the sense that her daughter, her second child, is a healthy child. Mrs. O’Brien is still in hospital recovering from the effects of the surgery which she was obliged to have. She will continue in hospital at least until the end of this week. I think, Mr. Chairman, as a matter of common humanity, her desire to have her husband present at least until that time, Mr. Chairman, is something which is unsustainable by anybody with any sense of common humanity. I am not here, Mr. Chairman, to engage in any controversy with you or any members of the team. But I am here to say that my client has been distressed by the reaction of the Tribunal and, of course, by something over which the Tribunal has no control, and that is a rather malicious way in which these matters were referred to in some sections of the media. As I say, this has been a matter of great distress for her, Mr. Chairman. She doesn’t wish to engage in any personal confrontation with you, Mr. Chairman, or anybody else in this Tribunal but I have been asked to bring these matters to your attention. May it please you Mr. Chairman. MR. McGONIGAL: The only matter that I wish to draw attention to, Mr. Chairman, is the fact that the last letter of the 19th of June which Mr. Healy referred to was a letter which was handed to us as the Tribunal was sitting. It’s not, therefore, a letter we have had an opportunity of considering in depth. However, in the circumstances, since the Tribunal will be resuming Mr. O’Brien’s evidence on Monday, I think that the less said at this stage to matters which have been discussed in the correspondence, the better, so that the Tribunal should be allowed to get on with the work, with Mr. O’Brien’s evidence being taken on Monday, and I can deal with such matters which may arise from this letter by way of correspondence to Mr. Davis or Mr. Coughlan. CHAIRMAN: As to the remarks made by Mr. Cooney which I, of course, consider with appropriate care, I do not, in the circumstances, propose to make any apology for what has taken place in this Tribunal, although I am fully understanding of the stress and concern that was occasioned to Mrs. O’Brien and her wish for privacy. It seems to me that in the exercise of my public duties as Chairman it was incumbent upon me to seek some form of medical attestation of the nature and degree of complications in Mrs. O’Brien’s immediate pre-natal condition that caused concern in the latter part of last week. It seems easy enough to refer to the analogy of a very substantial civil or criminal trial in the courts in which a health or similar emergency befalls a witness. In those circumstances it would be the, effectively, invariable practice that the judge hearing any application for an adjournment, whilst not in any way indicating scepticism or disbelief as to matters raised by legal practitioners, should seek attestation by way of a medical report. That is what was sought from Mrs. O’Brien’s consultant gynaecologist and that report, whilst as Mr. Healy had said, it is not going to be opened, it did indicate that there were matters of immediate concern which understandably caused Mrs. O’Brien and her husband to have very considerable perturbation in the latter portion of last week. As has already been stated in the letter, I am very gratified and pleased that the birth went satisfactorily and that mother and child are well. There was a measure of last-minute rush in the degree of communications between counsel as to the actual state of knowledge that was conveyed to me as to the nature or degree of urgency in the position. I accept from the medical report that there were matters which justified some immediate respite for Mr. O’Brien from the demands of testimony, at least in the latter part of last week, and I believe it would have been wrong in principle had I not sought a medical report in relation to what transpired. As regards the other matters, I am going to make the minimum of observations because I think the essential consideration, given the length of time that this Tribunal has already occupied and the considerable amount of work that still remains to be done, is that, as indeed Mr. McGonigal has implied, that those concerned should return as quickly as possible to the business of furthering this particular phase of evidence. I am not, as I have said on an earlier occasion, a thin-skinned person, and indeed I think it would be scarcely behove anyone chairing this particular tribunal to be inordinately sensitive as to robust exchanges in the chamber, as to vigorous correspondence that we have had with numerous practitioners and, indeed, as to the general hurley-burley of comment that understandably takes place on the matters of importance that are being dealt with here. I have to say at the same time, whilst I am not going to take any egotistical stance on it, that in the course of my virtually fifteen years of service as a judge, some recent events in this Tribunal have constituted the first occasion in which I have been alleged to be guilty of bias or of other qualities that certainly would not befit the chairman of a public tribunal of inquiry, or indeed a serving member of the judicial arm of government. I am not amused by these observations by letter, which I consider to be entirely unwarranted and unjustified and still less am I amused at the occasional further tendency to make gratuitously derogatory remarks, as it appears to me, in relation to members of the Tribunal legal team. I am not going to become embroiled in controversy in this regard but I do want to stop this type or tenor of correspondence, be it at 7 p.m. on successful days that were intended to be sitting days or otherwise and I would ask that experienced and senior practitioners reflect in the course of their preparation of letters not merely on the duties owed to individual clients but on the duties owed to institutions of this State, such as this tribunal, not myself, but the institution that is represented in its establishment, unanimously, by decision of both Houses of the Oireachtas. I do not want this Tribunal to degenerate into any form of unseemly or guerilla warfare. It has, over its lengthy sittings to date, avoided disputatious or unpleasant acrimony on virtually all of its sittings and I am very anxious that it continue and conclude its work on that basis. It is not, I think, necessary that I seek to give any assurance that I will continue to devote completely objective, fair and dispassionate attention to any of the facts that emerge in evidence before this Tribunal, as in the report that will be prepared on foot of them, whether in regard to Mr. Denis O’Brien or any other person whose interests may fall to be affected by the events that take place up here. If it were in any way otherwise, I should not be here as Chairman and I should not be a serving member of the High Court, for I consider the work done here, while I am seconded to this Tribunal, as being fully bound by the oath of office which is at all times binding upon me. Indeed, whilst these less than ideal letters have been exchanged over recent days, the Tribunal has continued its investigative work and whilst I am certainly not going to go into the minutiae of any matters until the appropriate evidence is tendered, some of that evidence that has been further gathered has transpired to be favourable to versions of events advanced by Mr. O’Brien. As I have already indicated, the Tribunal is not unresponsive to the domestic emergency and family interests that arose in the complications immediately prior to birth experienced by the O’Brien family last week. I do consider that it could have been possible for evidence to have been resumed at least at some latter stage this week, rather than being deferred until Monday next. But as has been stated in the letter read by Mr. Healy, it is pragmatically a preferable expedient that evidence definitely resume next Monday as regards Mr. O’Brien’s continued testimony rather than any further deferral or potential complications that might arise from differences between the legal advisers in this regard. Accordingly, whilst I am not making a peremptory order as such in relation to Mr. O’Brien’s attendance, I am regarding it as incumbent upon him that he will attend to continue and further his evidence on Monday next at eleven o’clock. I have already canvassed with Mr. Healy the possibility that some limited amount of further evidence could be adduced in the latter part of this week, whilst not seeking to distort the intended sequence of witnesses which was decided upon by the Tribunal and which reflect Mr. O’Brien’s advisors’ own requests that he be called first on this particular aspect of issues. Accordingly, I will reserve an entitlement to announce on the website any limited further evidence that it might be possible to call in the latter part of this week and, failing that, the Tribunal will, without fail, resume its hearings on Monday next at 11 a.m. I regret the trouble to the advisors, to Telenor and to those other persons attending today in anticipation of a substantive hearing. This, in the interests of everyone, must proceed at latest on Monday next. THE TRIBUNAL THEN ADJOURNED UNTIL MONDAY, 25TH JUNE 2001 AT 11AM.